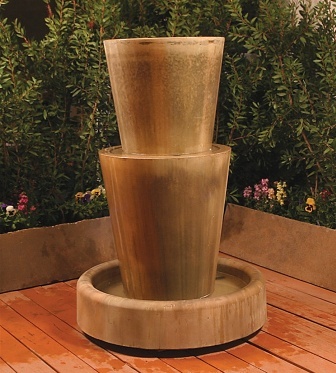 A sleek and simple design, the Two Level Jug Fountain is the perfect accessory to your garden decor. Water streams from the top of two tiered jugs, dancing down the sides before falling into the round base below. Durably constructed of glass fiber reinforced concrete GFRC, this fountain has the look of genuine cast stone but is much more durable and lighter for easier maintenance. Superior craftsmanship and minimal maintenance. ships within 4-6 weeks and will arrive securely packed on a pallet. Shown in Sierra finish.